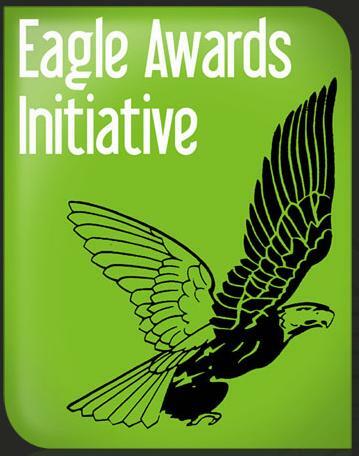 At the Bristol Comics Expo last week the first hints of a relaunched Eagle awards were unveiled. If you weren’t there, you’re at the mercy of bloggers who were, and they’re strangely quiet. Barry Renshaw (of RedEye and Engine Comics) was brought in to help relaunch the Eagles. Today Barry posted a link to The Eagles Initiative. Ashcan version: it’s basically a competition for non-commercially published professionals. There’s a small entry fee, with three quality cash prizes and a short publication deal in a well-printed anthology book. The Eagles have been a stagnant non-event for a few years, which is sad as they also have a prestigous sentiment with which old-timers and the 30s years generation fondly associate. By extending that association, the Eagles should function to serve the next lot of young cartoonists. Certainly, away from charges that awards are self-indulgent. Kenny Penman (of the Forbidden Planet Blog and Blank Slate) sugested that he was unhappy with these restrictions, and I have to agree. Use of this size has increased in Britain but the dominant format (among an estimated four new print comics per day) is A5. Oh, we used to use A4 a lot, much like the Japanese. Multiple approaches always work better than the singular. ….For the purposes of auto-biography or documentary. On the whole, this is very optimistic news. As a consequence, future awards will probably widen categories, addressing small-press and commercial independent differently, as part of the UK’s postmodern heritage. Speaking of the awards, the nominations were also announced at Bristol. Go vote now! 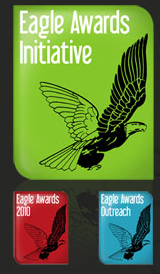 The results of The Eagle Initiatives will be released in October at the Birmingham Show. The Awards winners are also announced in October. Co-Operation? Well done. Barry Renshaw will also be appearing at the 2D Festival in Derry on 3rd-5th June to talk about the Eagles Initiative. So, I’m looking forward to asking him who will be presenting the Phonogram creators with their awards, and how they’ll be doing it.